Here we are, on Castle Hill, on the Buda side of Budapest. Paddle into the distance and you'll eventually come to Bratislava, Vienna, and Linz before arriving--800 miles from here--in the Black Forest headwaters of the river. What? You need to be told that it's the Danube? Oh, I forgot, we don't do geography any more. 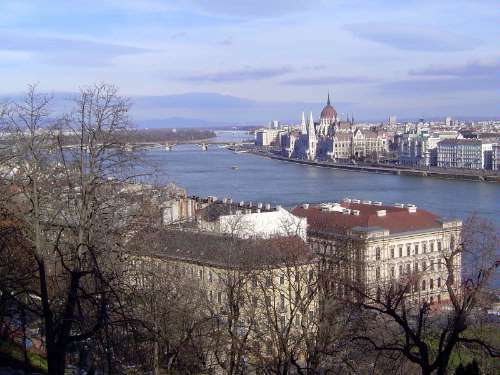 And while we're at it, I suppose I should say that the name Budapest was bestowed on this place in 1872. Until then it had been Buda on this side and Pest (better, Pesht) on the other. See that nice dome over there?